Open Automation Software Tags can be defined to connect directly to Modbus slave devices or host data to Modbus masters with the built in Modbus Driver Interface which supports communications over Ethernet and Serial interfaces for Modbus TCP, Modbus RTU, and Modbus ASCII protocols. 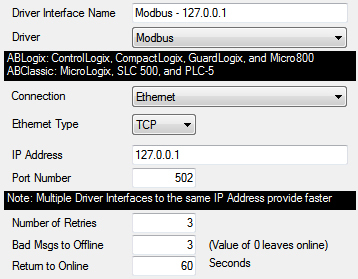 If the communications for the Modbus driver is not working at all you may need to set the default network adapter priority in the operating system. The following steps can be used to setup direct communications with Modbus devices. Select Configure-License and verify that Modbus is one of the available Drivers in the lower left of the form. If you do not see Modbus available contact support@openautomationsoftware.com to update your license. Note: Optionally select the Live Data Cloud node if you are hosting Modbus data over the Internet with a standard Internet connection. 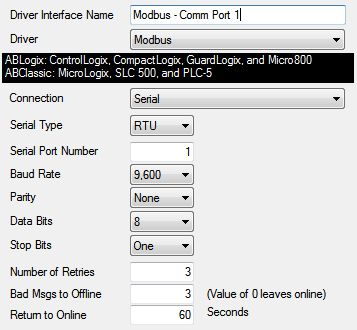 Enter a meaningful Driver Interface Name that you will refer to this physical connection when defining Tags with a Modbus Data Source. Specify the Connection as Ethernet or Serial. Specify the Modbus Type as Master or Slave. Note: Device Address is defined at the Tag level in the next step. Note: If you are using a Connection of Ethernet you may need to Set Default Network Adapter for Driver Interfaces. Note: When using Ethernet you can setup multiple Driver Interfaces to the same IP Address to provide parallel processing when there are a lot of tags defined to the same IP Address. 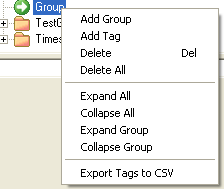 Change the Data Source Tag property to Modbus. Specify the desired Polling Rate for the Tag. Select the correct Memory Type from the Memory Type pull down. For Input Register and Holding Register Memory Type select the correct Modbus Data Type. 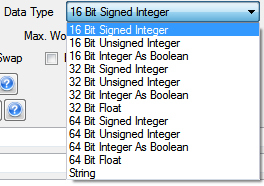 Note: Use the “As Boolean” types to access bits of a 16, 32, or 64 bit Integer. Specify the Address for the memory location. Note: Zero Based Addressing will subtract 1 from the address when communicating to the device. Note: You can also programmatically define Tags and Drivers using the OPCSystems .NET component with the TagCSVImport and DriverInterfaceCSVImport methods or the REST API. 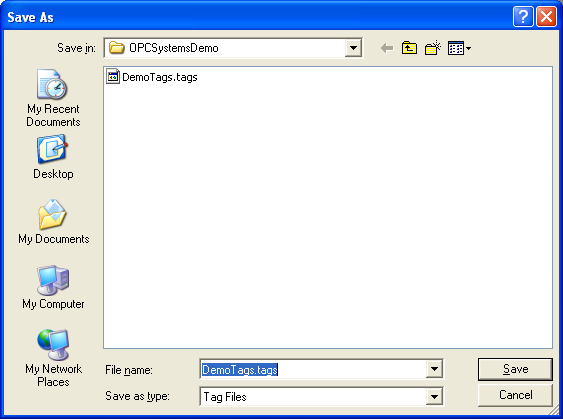 Save the file DemoTags.tags in the directory C:\OPCSystemsDemo.